GameWorks projects are always fun and colorful, but then what would one expect from a venue built around state-of-the-art video games? Oh, and food ... lots of American bar fare with images that make your mouth water while trying to lay out a menu. Though the vast majority of work done for GameWorks has been in the form of HTML emails, there hasn't been any shortage of print work — labels, table tents, coupons, loyalty cards and menus — the list is long. GameWorks also has a number of crossover projects. For example, some billboard designs — traditionally print genre — were produced for digital display, and some coupons, while printed, were delivered via web, so files would be set up in the RGB spectrum as opposed to traditional CMYK. The Control-Alt-EAT campaign was designed to target ... well, geeks. I was asked to develop a logo that tied the play on words in with a something that spoke to food and develop a flyer. 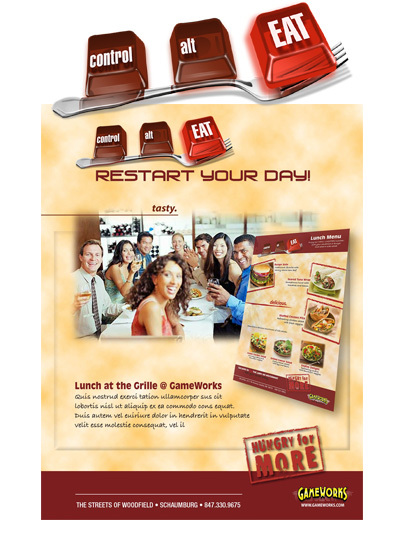 The edible-looking keyboard keys and fork hit the mark for the client. 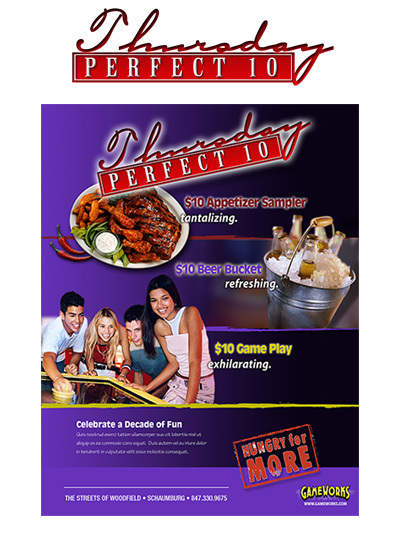 Perfect 10 Thursdays married $10 food dishes to $10 of game play. I was asked to develop the logo design, with a somewhat nostalgic feel, and the accompanying flyer.